Although the lowest-priced models are now available for less than 700 Euros (~$948), ultrabooks still have the reputation for being elegant premium devices - with an open-ended price scale. 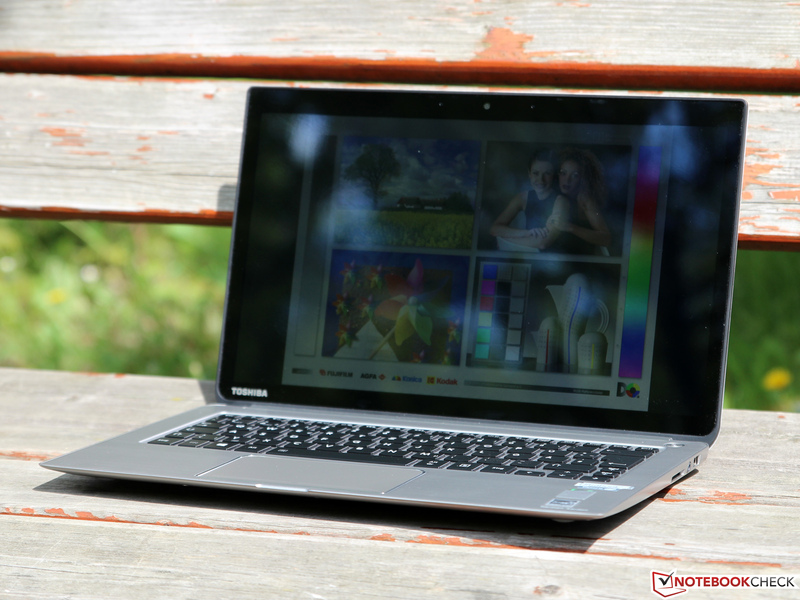 Models, such as the Asus Zenbook UX301, Dell XPS 13 or Apple MacBook Pro 13 (not officially an ultrabook), currently mark the premium range, and Toshiba now wants to join in. 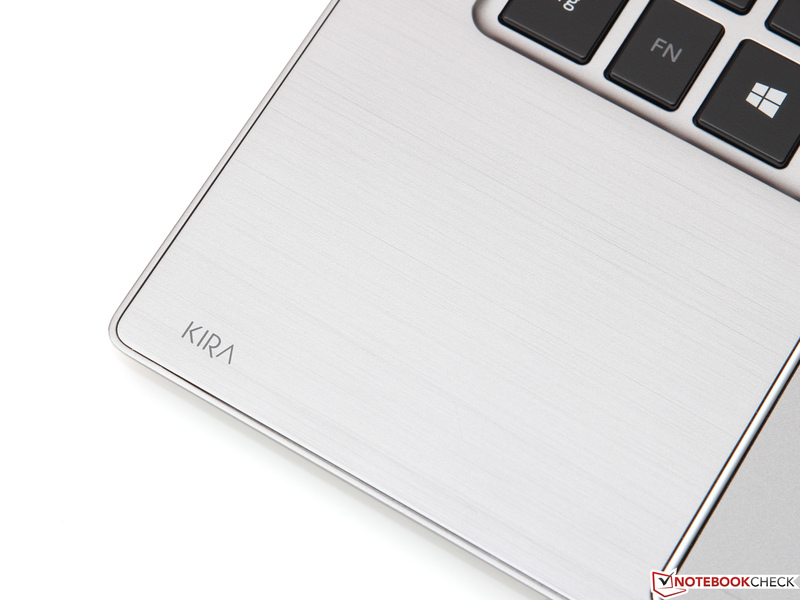 The 13-inch ultrabook dubbed Kirabook (or Kira-101) relies on noble materials and high-performance hardware to justify the confident purchase price of approximately 1500 Euros (~$2054). 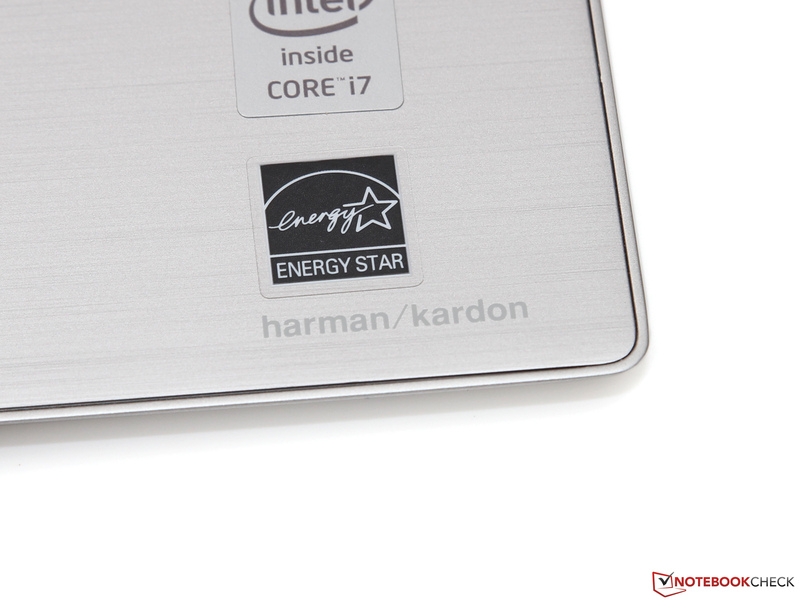 A Core i7 processor, 8 GB of RAM, and a 256 GB SSD are almost standard in this category. 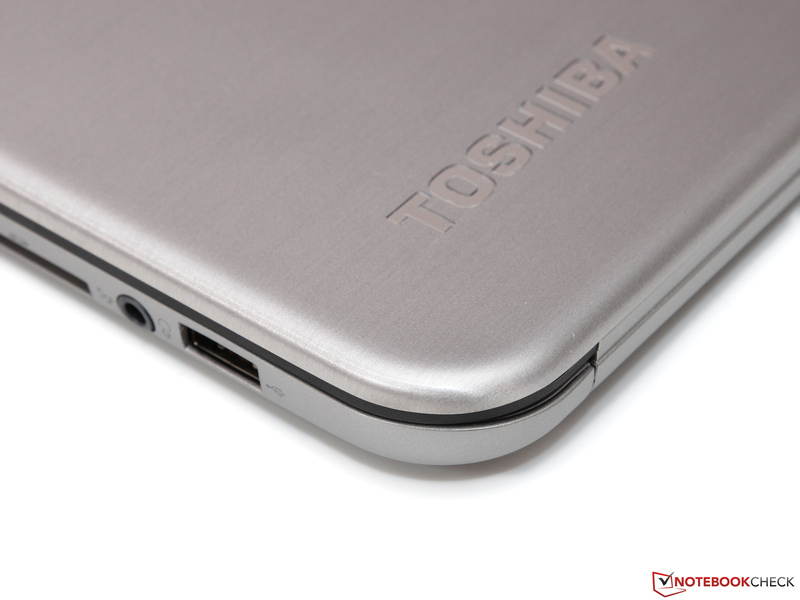 Besides that, Toshiba adds a touchscreen with 2560x1440 pixels and a high-speed 802.11ac Wi-Fi module on top. Sounds interesting, so let us see what the total package has to offer. There's no accounting for taste; it is up to the reader to decide whether the black and silver-colored casing is stylish or boring. Fact is that the first quality impression is very high: Brushed magnesium surfaces adorn both the casing and lid, the display is protected by scratch-proof Concore Glass from Corning. The extremely narrow display bezel is especially noticed in this relation. Depending on the side, it only has a width of 1.1 to 1.7 centimeters. 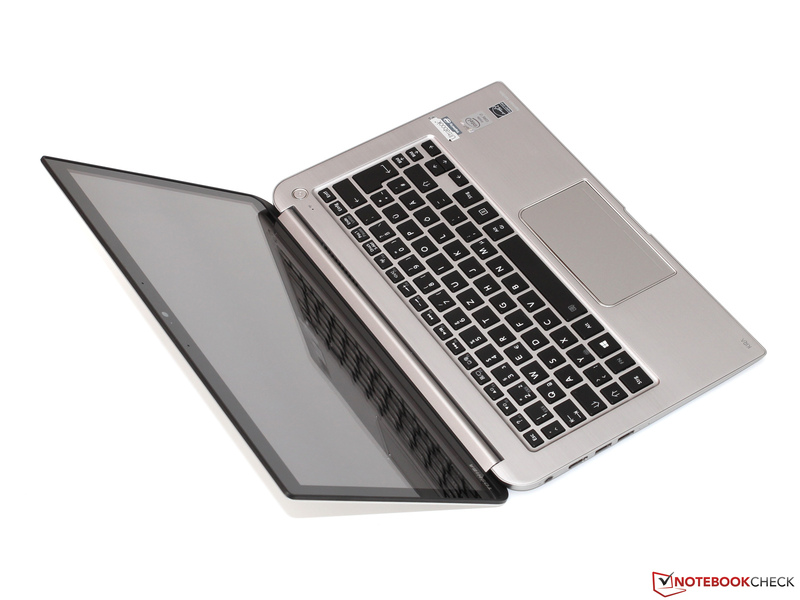 That allows for an extremely compact surface area on par with a conventional 12-inch laptop. But the height of almost 20 millimeters does not set new standards. 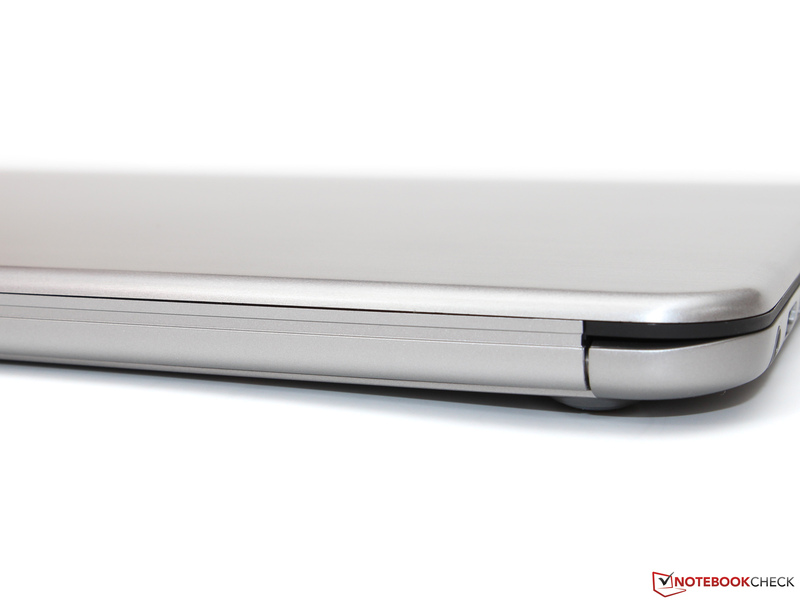 However, the ultrabook looks slimmer due to its wedge-shape design. 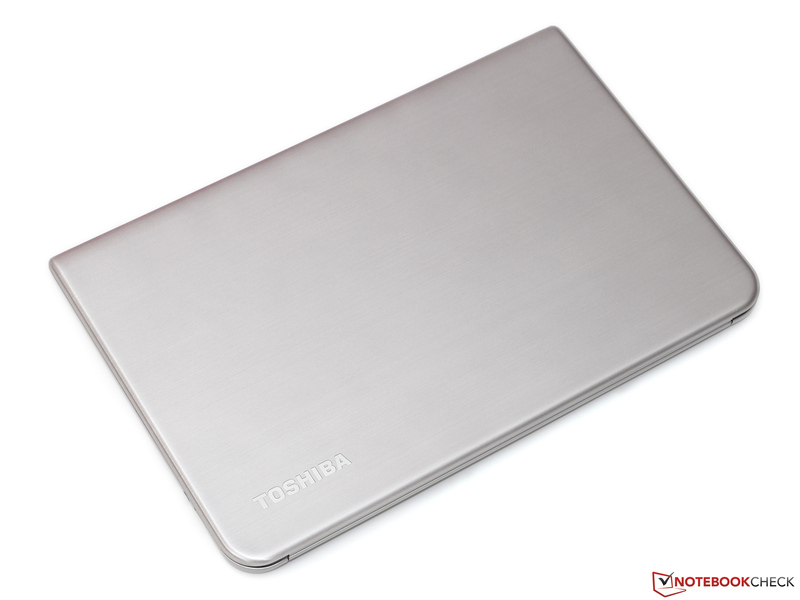 Owing to the generous use of light metals, Toshiba managed to keep the weight below 1.3 kilograms without affecting stability much. Particularly the base proves to be very rigid and barely warps even when using high force. 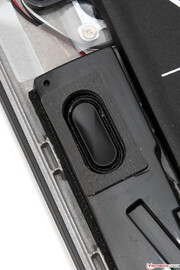 The screen's thin build is noticed even more; we would appreciate a somewhat better stiffness here. 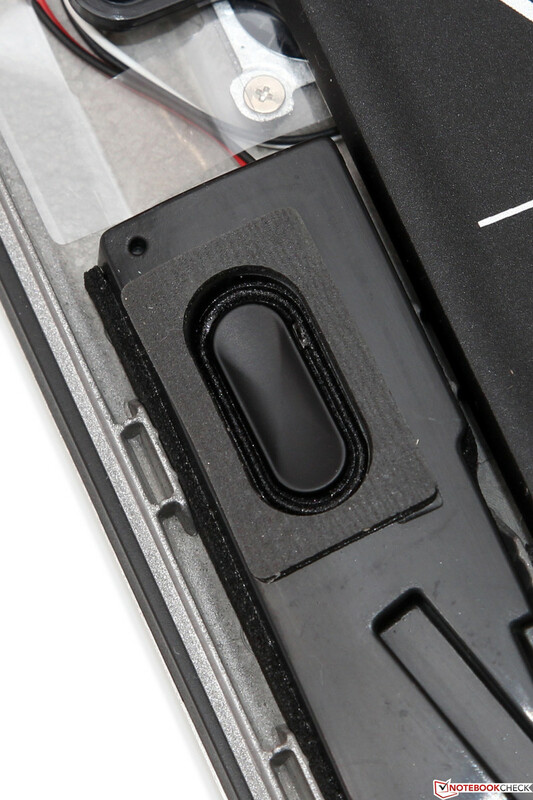 The corresponding hinges are pulled agreeably tight (both hands needed for opening) and they are quite accurate, which reduces annoying wobbling when making touch inputs. Finally, we look at the build quality, where there are only few details that can be reproached. For example, some gaps of the two-part base unit could be marginally smaller - being a bit fussy in this price range is allowed. 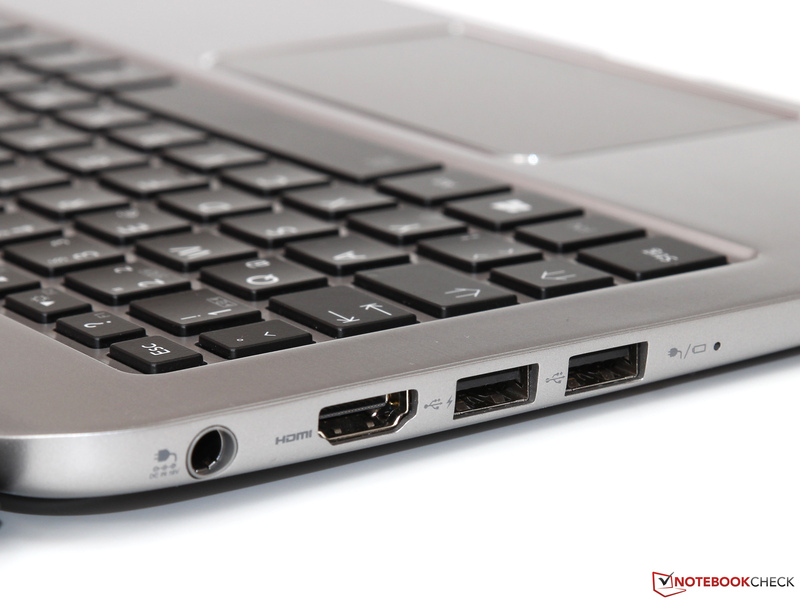 The Kira-101 features a slightly better connectivity than the contenders from Asus and Dell with a total of three USB 3.0 ports. However, both latter contenders offer a modern DisplayPort. Toshiba only installs an HDMI out. Although it allegedly even supports the Ultra HD standard with 3840x2160 pixels (presumably at a maximum of 30 Hz), many high-definition PC monitors can only indirectly connect via HDMI. A headset jack and an SD card reader round off the interface array that is distributed over both sides of the casing. The spacing between the single ports could have been a bit more generous because very wide USB peripherals might obstruct neighboring ports. 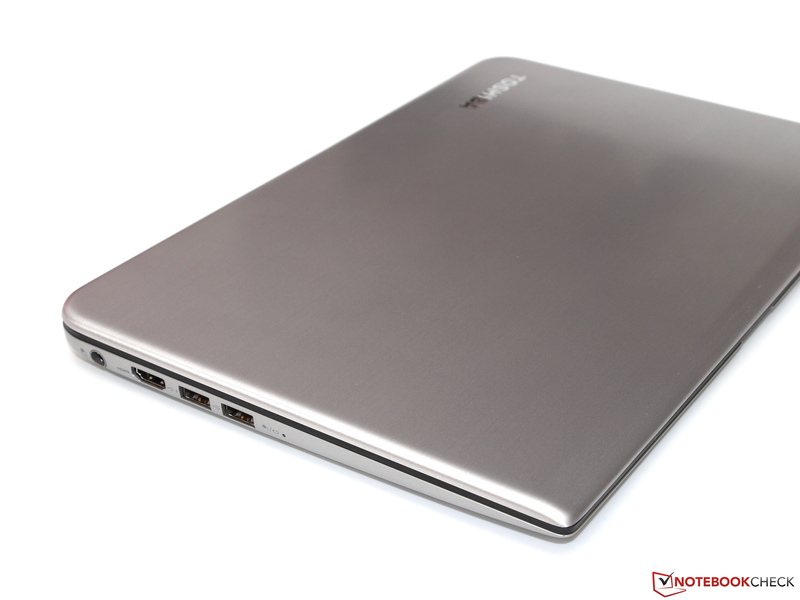 Like many other ultrabooks, the Kira does not sport a LAN network socket so that the user has to be satisfied with Bluetooth 4.0 and Wi-Fi. Our sample supports the latter in all current standards including 802.11 ac via Intel's Wireless-AC 7260 dual-band adapter. Two antennas and dual-stream technology (2x2) ensure an equally stable and high-speed connection with gross transmission rates of up to 867 Mbit/s, providing the corresponding router is available. 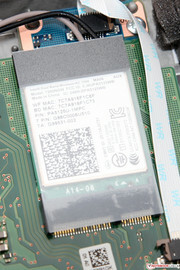 Unfortunately, an integrated 3G/4G wireless module is generally not offered. In view of the 5 megapixels and more in front-facing cameras in smartphones, the 0.9-megapixel lens in the Kirabook makes an outdated impression. However, the contenders do not feature more either. The image quality is consequently on a modest level, making it only suitable for video chats. We can give the virtually noise-free and very well intelligible array microphone a better grade. Apart from the usual leaflets and a small, 45-watt power adapter, no extras are found in the nicely printed box. The manufacturer could have at least included a LAN adapter - it costs an immoderate 49 Euros (~$67) as an official accessory. The pre-loaded software bundle also only includes the most necessary, for example, various system tools and a virus scanner (McAfee Internet Security, trial). However, we do not want to complain about this minimalism considering the limited SSD storage capacity. A conventional Philips screwdriver is the only tool needed for opening the casing that is secured with a total of 11 screws on the underside. The mSATA SSD and Wi-Fi module can be replaced, and the battery fixed with screws could principally also be exchanged after removing the base plate. 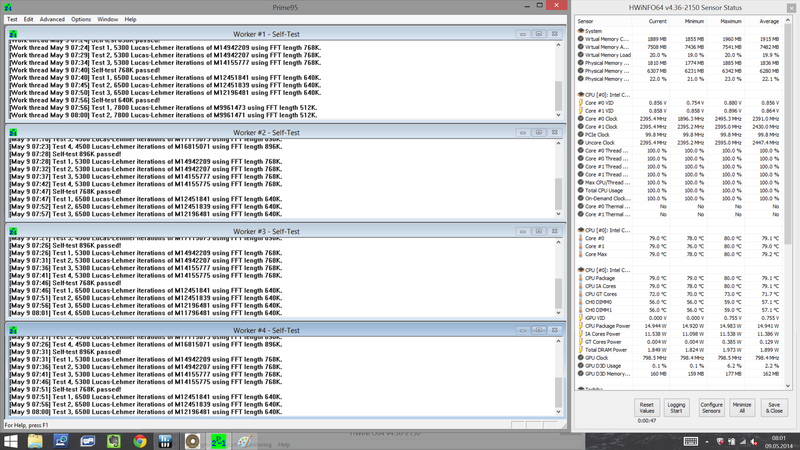 However, the working memory and CPU are soldered (note: all Haswell ULV models are only available as BGA versions). 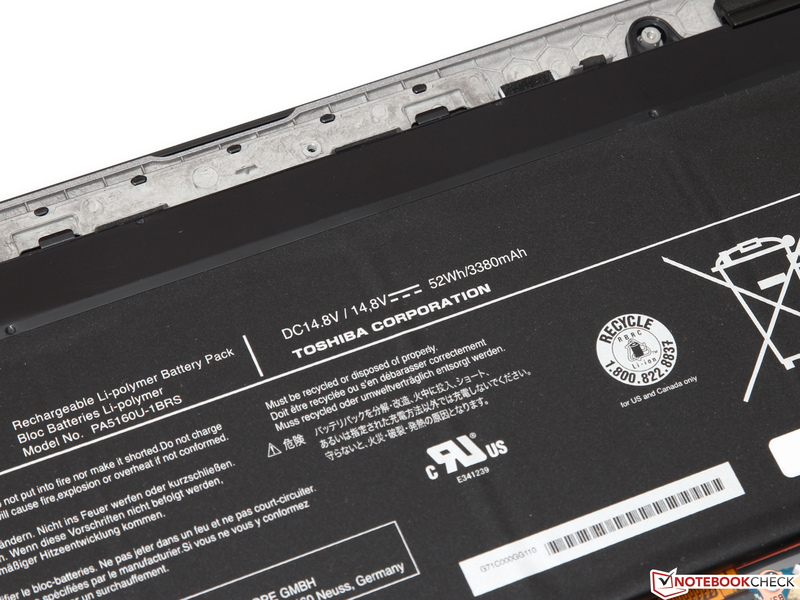 Toshiba includes a two-year warranty ex-factory for customers from Austria and Germany. It can be upgraded for a relatively low price. For example, an upgrade to a total of 3 years costs 69 Euros (~$94), and 109 Euros (~$149) is charged for 4 years (both RRP) - we believe that is reasonable. 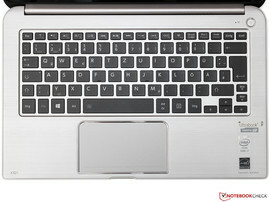 The casing's upper side is made of one piece and accommodates a black chiclet keyboard with 15 x 15 millimeters keys that are backlit by white LEDs. The layout largely corresponds to the standard (very small left shift key, PGUp/Dn position), allowing quick familiarization. 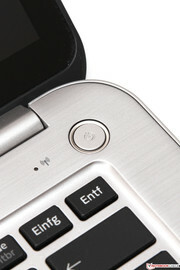 A very direct typing feel is created by the center area's excellent stability and the pleasantly crisp pressure point. It provides the user with an exact feedback about every input. 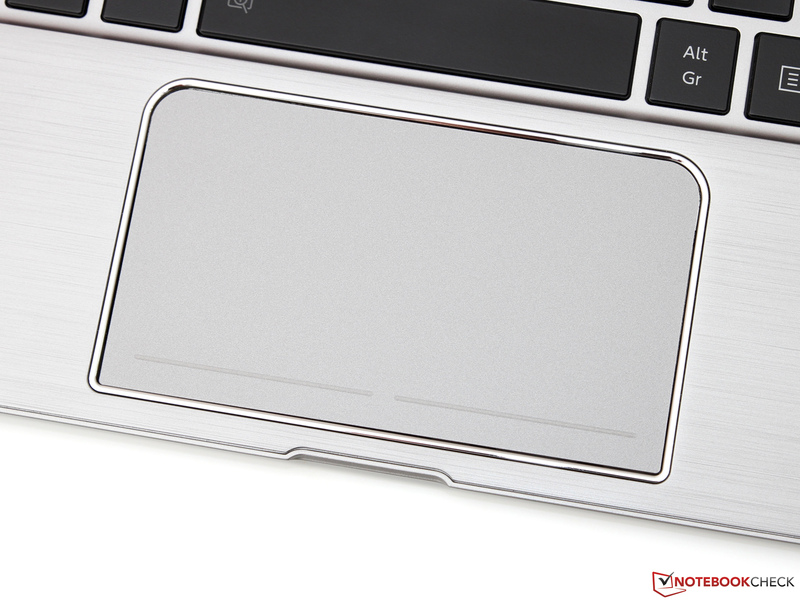 The space bar responds quietly and reliably up to its outer edges. We did not ascertain jamming or clattering noises like in some low-cost laptops. 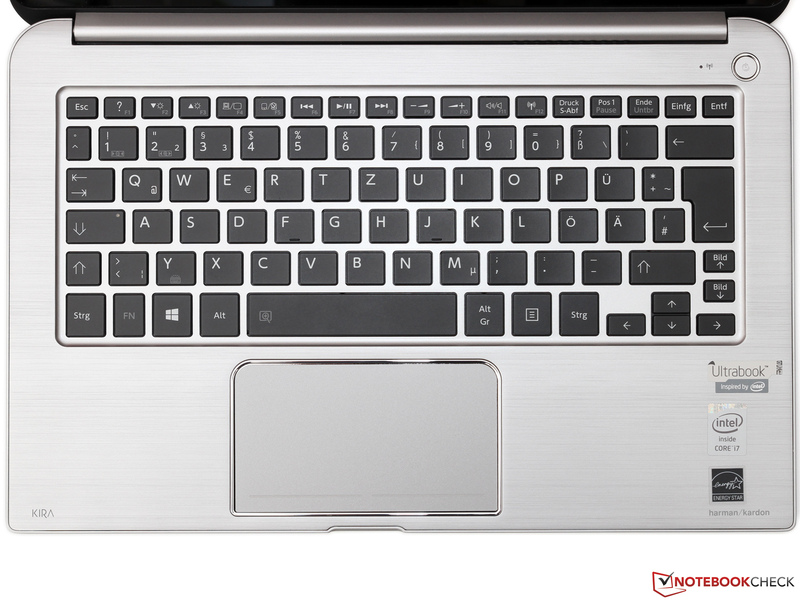 Overall, a well-designed keyboard that is suitable for typing even longer texts. 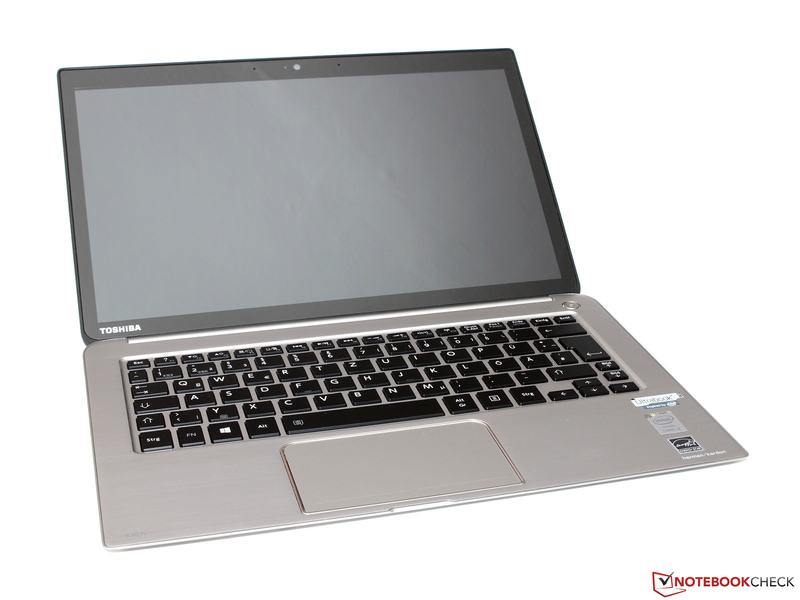 Toshiba trusts a touchpad model from the experts Synaptics. Its design is enhanced by a stylish rim in chrome looks. The sleek surface of 10.5 x 6 centimeters provides enough room for multi-touch gestures using two, three or even four fingers. 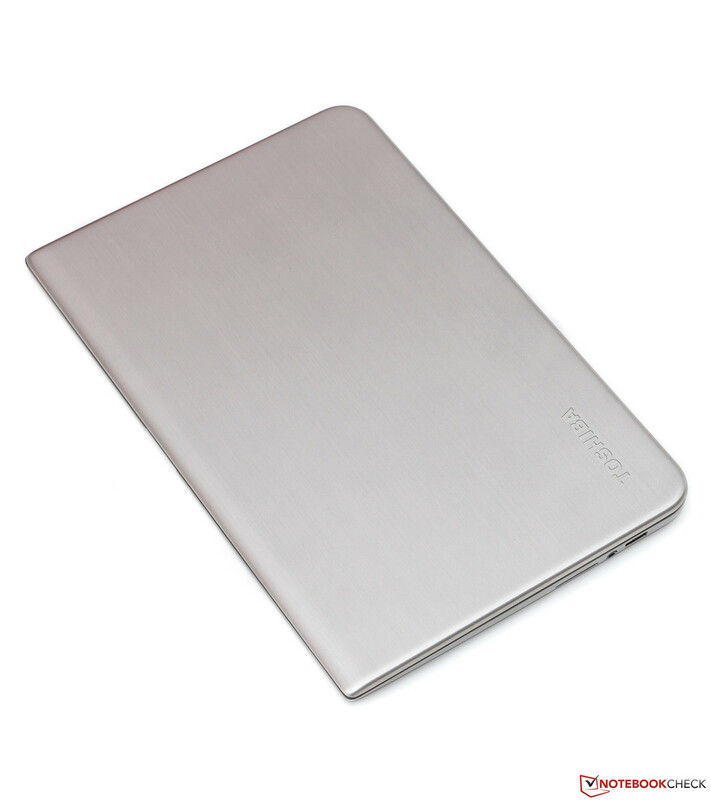 Beyond that, the accurately working pad makes an outstanding impression. Like most contenders, it does not feature dedicated mouse keys, but the agreeably firm ClickPad buttons with a short drop quickly compensate for this drawback. 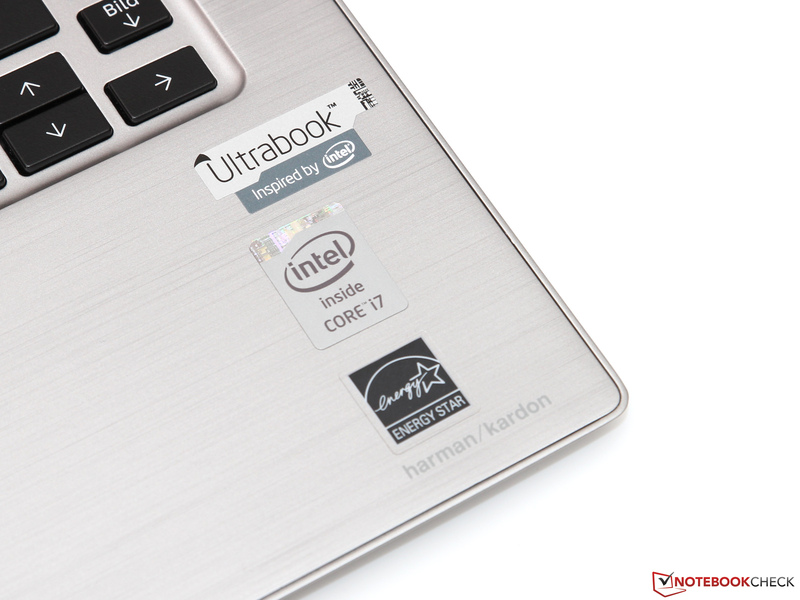 Since Haswell's release, a touchscreen is a must when a manufacturer wants to adorn its device with the strongly desired ultrabook title. Users have to decide for themselves whether that is really needed. In any case, we cannot criticize the technical implementation in our review sample. All inputs were executed with impeccable accuracy and without noticeable delays. 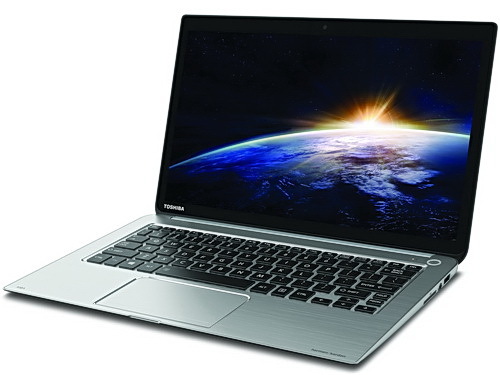 Toshiba only recently introduced one of the first laptops featuring a screen with the Ultra HD resolution of 3840x2160 pixels with its Satellite P50t-B. The smaller Kira-101 does not quite match that, but 2560x1440 pixels are also quite impressive. In relation to the screen size of 13.3-inches, that results in a remarkable pixel density of 221 dpi - hardly less than in Apple's "Retina" models like the MacBook Pro 13 (227 dpi). The size of most fonts and icons can be modified almost as much as the user wants, owing to the improved scaling options of the pre-loaded Windows 8.1. Only a few older applications are suitable to an extent for such high dpi rates. A look at the screen's brightness is disappointing. Where other premium models achieve over 300 or 400 cd/m², the Kirabook only manages a poor 223 cd/m² - a very modest result. The backlight cannot quite cover disturbing reflections even indoors, for example, in brightly illuminated offices or beside windows. Outdoor use is even more adverse, but more about that later. We first want to look at the image quality. The IPS screen made by Sharp (LQ133T1JX03) can regain a few points. The black level of only 0.17 cd/m² ascertained in maximum brightness adds up to a fabulous contrast ratio of 1367:1. For comparison: Neither Dell's XPS 13 (687:1) nor Apple's MacBook Pro Retina 13 (900:1) can compete with that; only the Asus Zenbook UX301 (2138:1) remains unrivaled. Toshiba promises the buyer a factory-calibrated screen and consequently an especially accurate color reproduction. The result is impressive. With a DeltaE of just 2.5 (ColorChecker) and 2.55 (Grayscale), the Kirabook belongs to the best devices of its category. That is a real purchase incentive primarily for amateur photographers and image editors, although the competition featuring an apple is still a bit better here. As we hinted before, the ultrabook can only be used outdoors to a very limited extent due to the low maximum brightness. The intensely reflective glare surface escalates the problem even more, but this can hardly be prevented in a touchscreen. Thus, we can only hope that the manufacturer will install a stronger backlight in future - the resulting additional expenses cannot be used as an excuse in this case. 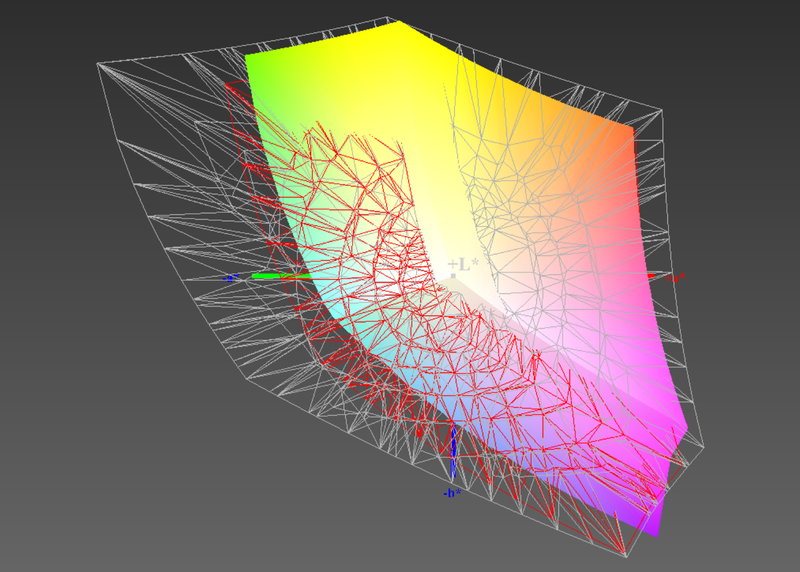 Compared with other IPS screens, our review sample is a bit more sensitive to side views. A subtle, yet visible grayish cast covers the image from an angle of approximately 20 degrees vertically. This could be due to the touchscreen layer and/or the Concore Glass. Apart from that, the image is mostly true and always well-legible. 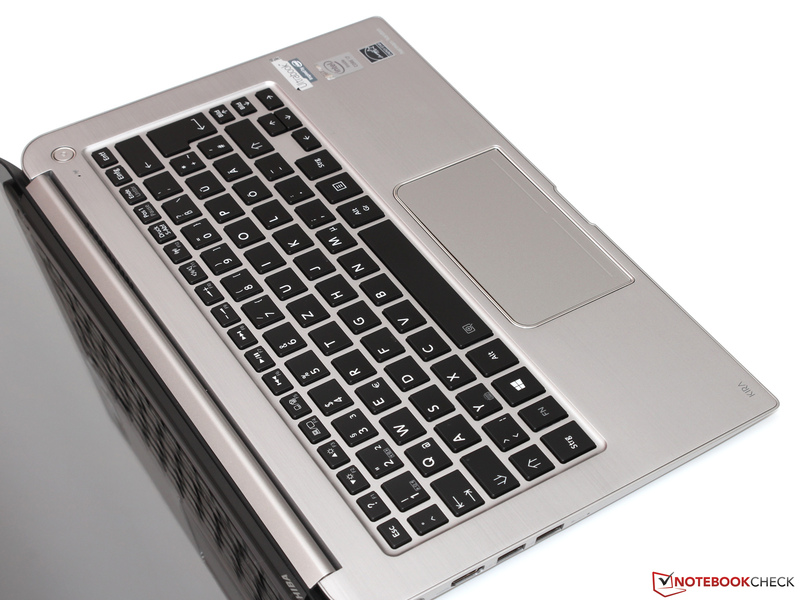 The "U"-series of the Haswell architecture designed for ultrabooks is divided into two different model lines that are specified with a TDP of either 28 or 15 watts. While Apple, and some Asus models, feature the faster 28 watt chips, an energy-efficient Core i7-4500U clocks in the Kirabook. 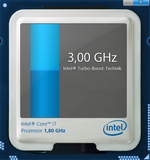 The dual-core's base rate of 1.8 GHz is consequently quite low, and a strong Turbo of up to 3.0 GHz (2 cores: 2.7 GHz) is to compensate for that. Hyper-Threading, alongside many other features that can be studied in our database, is for additionally improving the performance depending on the application. 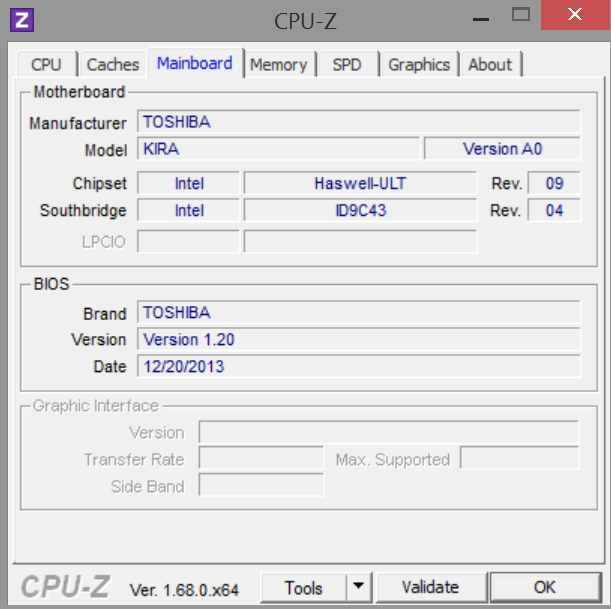 Toshiba opted against installing an additional GPU, and thus the HD Graphics 4400 (200 - 1100 MHz) takes care of all graphic tasks. We will examine whether the performance reserves are sufficient for at least basic games based on various benchmarks. The buyer does not have the usual choice or configuration options in terms of memory configuration - 8 GB of working memory and a 256 GB SSD are invariably specified here. 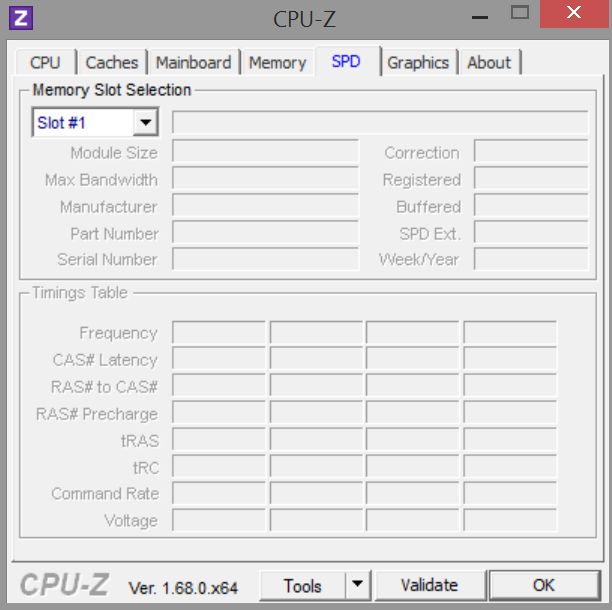 According to the matching results of different tools, the RAM only operates in the DDR3L-1333 mode, which should not cause any major losses owing to the dual-channel bus. Despite its considerably more energy-efficient processor, the Kira 101 easily keeps up with both the Zenbook UX301 (Core i7-4558U, 28 watts) and MacBook Pro Retina 13 (Core i5-4258U, 28 watts) in our CPU benchmarks. 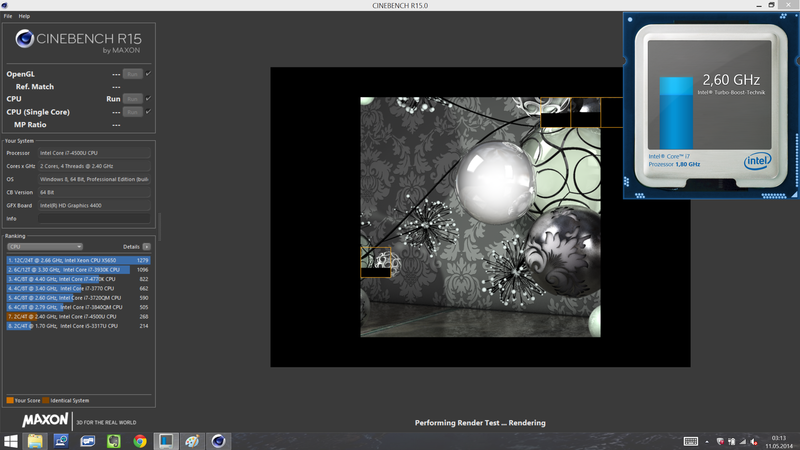 The contenders can also only reap in an advantage of not quite 10 and 20% even in the multi-thread test of Cinebench R11.5, where the Core i7-4500U soon finds the limits of its TDP of only 15 watts. This difference is virtually unnoticed in routine use, particularly since the differences are again lower when single threads are loaded. Dell's XPS 13 (Core i5-4200U, 15 watts), which is also optionally available in a stronger Core i7 configuration, has to be satisfied with fourth place. Pleasing: The Toshiba does not artificially throttle in battery mode; clock rates and benchmark scores remain stable even without the power supply. 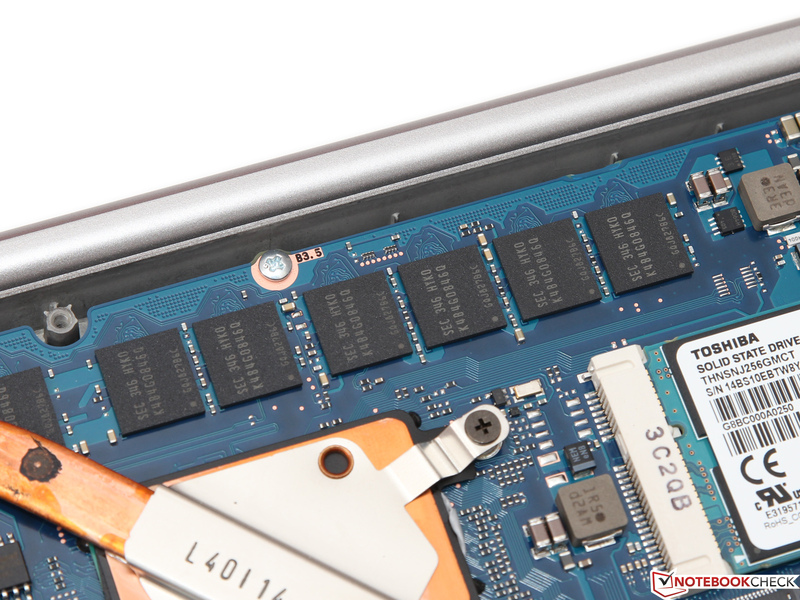 Unlike Asus and Apple, who use a RAID0 array (Zenbook) or a fast PCIe bus (MacBook Pro) to ensure faster transfer rates, a conventional SSD in mSATA format works in the Kirabook. 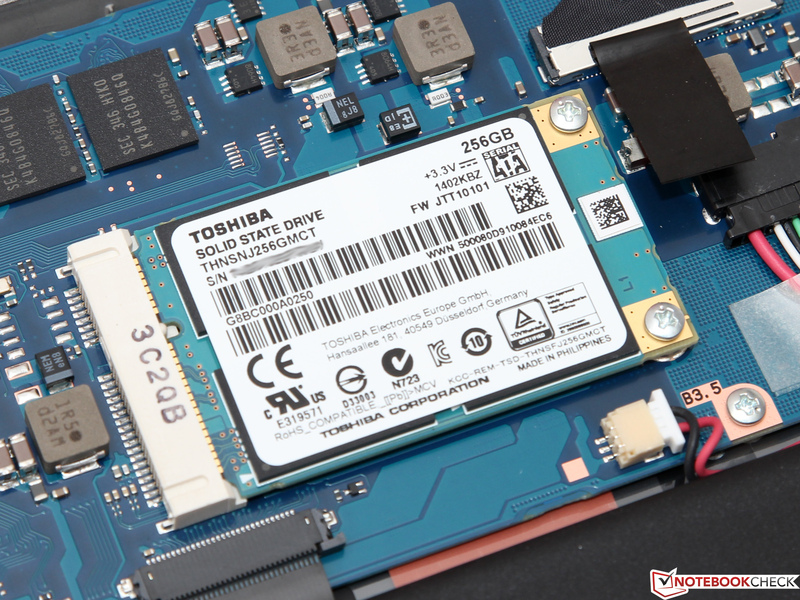 The Toshiba storage device dubbed THNSNJ256GMCT is not available on the open market. However, we assume a strong relation with the models from the Q Series Pro (19-nanometer MLC-NAND). 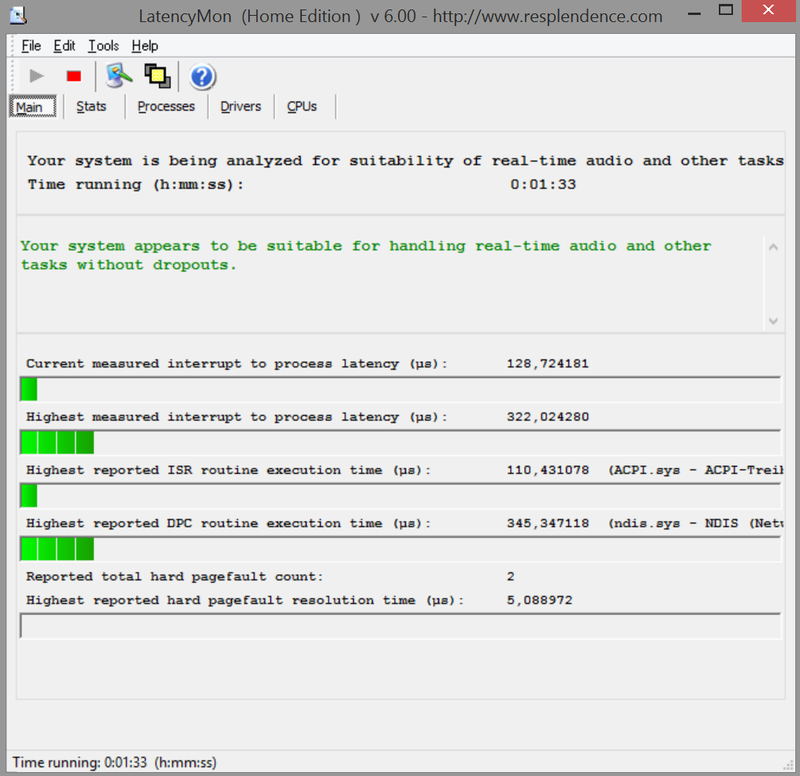 The sequential transfer speeds settle to around 500 MB/s due to the limiting SATA interface. 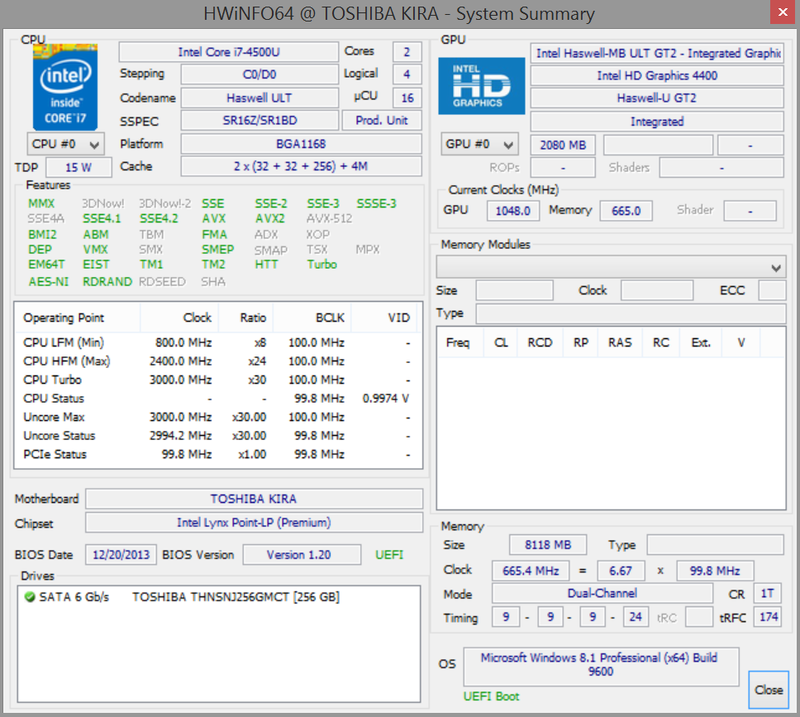 The drive is slightly above in read and a bit below this rate in write. 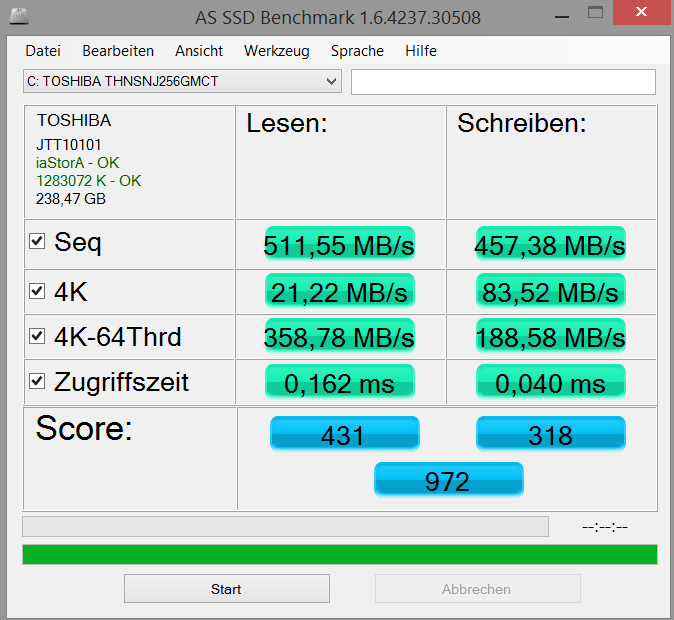 Alongside the good scores in the practical 4K tests, the SSD is approximately on par with a Samsung PM841 or Crucial M500. 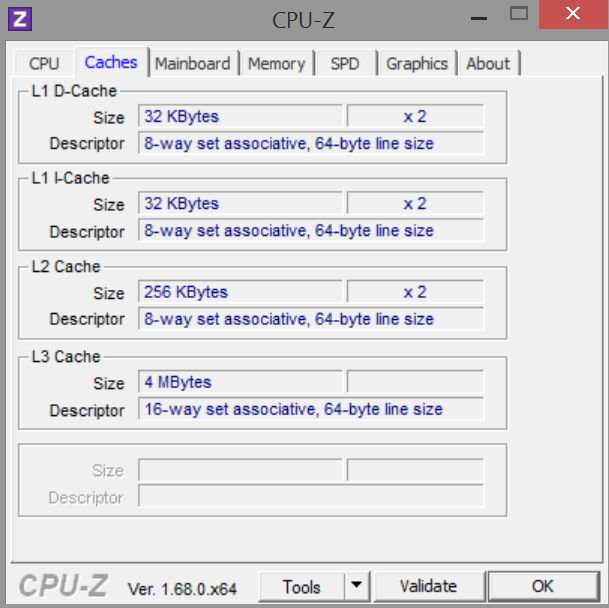 FutureMark's synthetic PCMark 7 benchmark suite primarily responds to swift processors and hard drives so that the rates of both previous exercises are directly reflected in the total score. Over 5000 points is more than impressive for a laptop of this size, although it is again not yet enough for defeating either the Zenbook or MacBook Pro. However, there is no reason for disappointment. Both the objective and subjective system speed is unquestionably beyond all doubt. It does not even take 10 seconds for the device to completely finish booting after a cold start, many application only need fractions of a second to open, and even more demanding software or multitasking are no problem for the ultrabook. 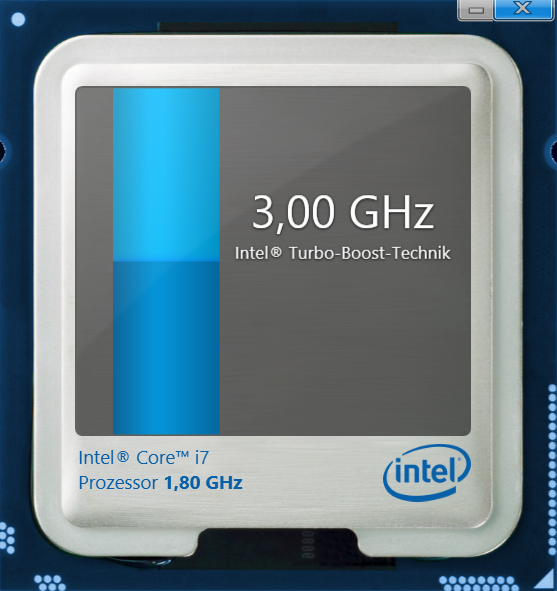 Only a considerably more power consuming quad-core processor would noticeably boost the performance. 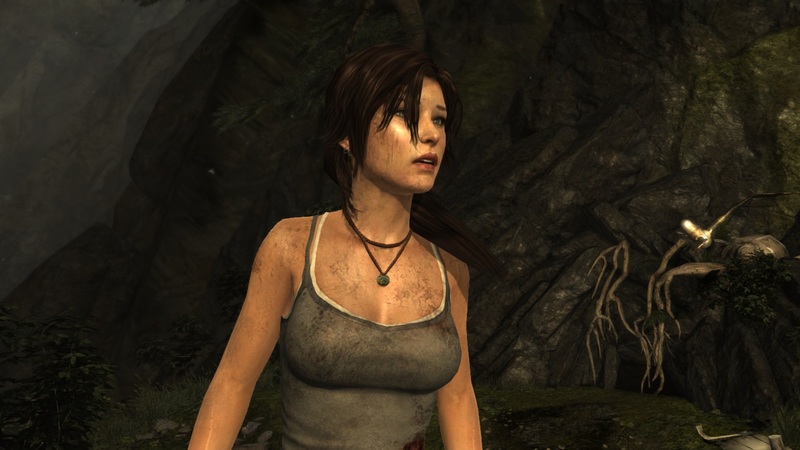 We would first like to examine the naming policy of current Intel graphics solutions. 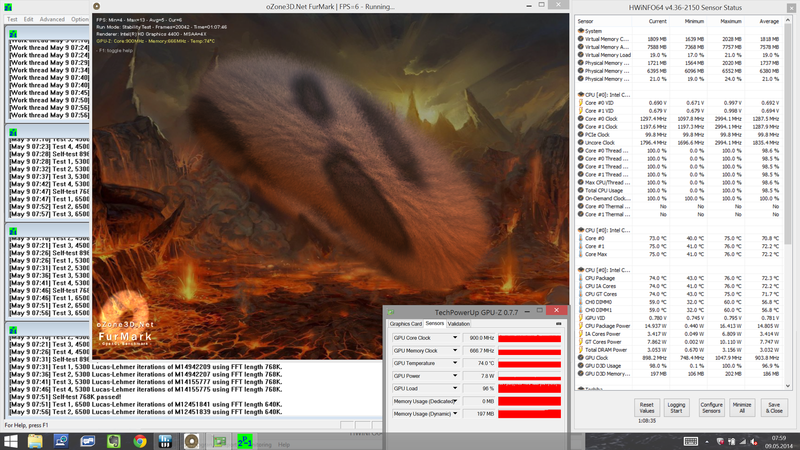 The HD Graphics 4400 is basically the intermediate expansion stage of the Haswell GPUs, also known as "GT2," which integrates 20 Shader blocks aka execution units (EUs). 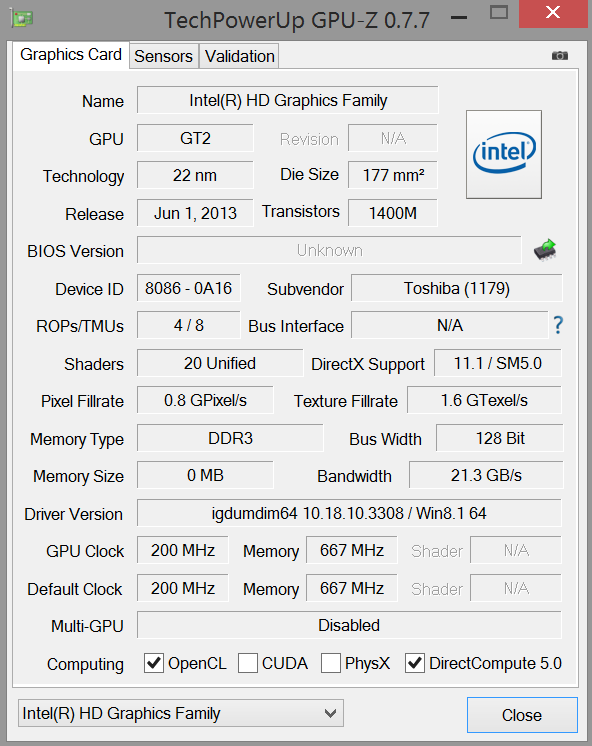 Both the HD Graphics 5000 and Iris Graphics 5100 offer 40 EUs ("GT3"). The only difference between these two models is a deviating TDP classification (15/28 watts), which in turn affects the achievable (Turbo) clock rates. Depending on the benchmark, the GT3 models can surpass the HD Graphics 4400 more or less clearly, with a lead of up to 40% in some cases. That might not seem like much in relation to the roughly doubled processing power at first glance, but the limited memory bandwidth prevents even bigger gains. 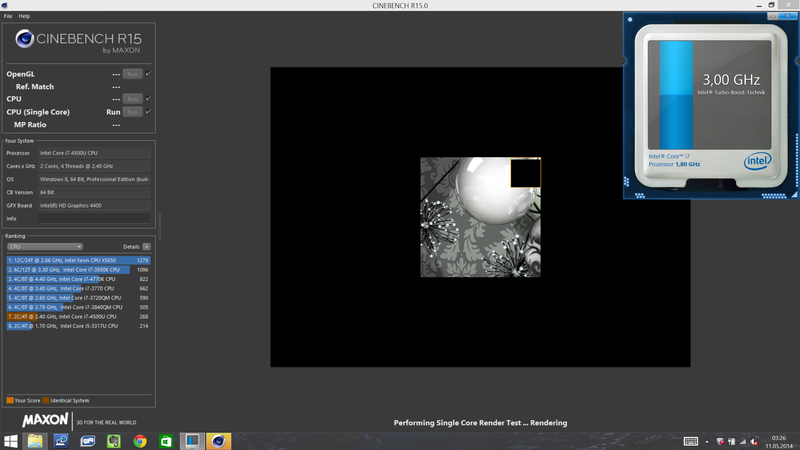 Unfortunately, we have to discourage any hopes of playing games in the WQHD screen's full resolution from the outset. The HD Graphics 4400 cannot render current titles with more than low to medium details in 1024x768 or, in rare cases, 1366x768 pixels. However, the HD Graphics 5000 of other 15-watt models does not offer a noticeable plus either. We would certainly ascribe that to the Iris Graphics 5100, but it does not calculate faster than a dedicated, entry-level accelerator, such as the GeForce GT 720M. The efficient Haswell CPU produces little waste heat, particularly in idle mode, and it can thus be cooled quietly. The fan is even completely inactive in most routine situations, such as office, Internet and video playback. However, the lowest speed is virtually inaudible even from a distance of a few centimeters. 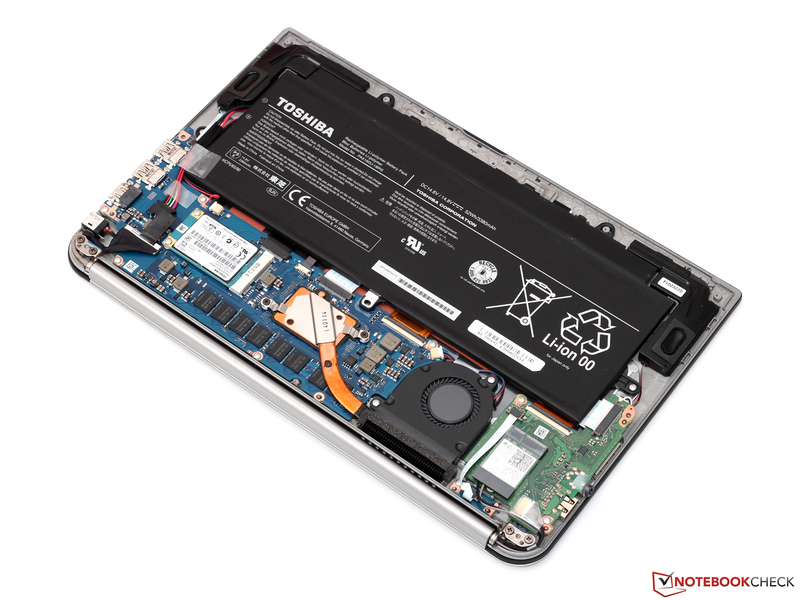 The Kirabook is not quite as satisfactory during full load. Although the metrologically ascertained noise level of 36.8 dB(A) is considerably lower than that of the Zenbook UX301 (up to 39.1 dB(A)) or MacBook Pro Retina 13 (up to 44.7 dB(A)), the high-pitched buzzing noise seems louder than it actually is. The slim magnesium casing's high thermal conductivity ensures that the chassis feels always exceptionally cool during low load. Our thermometer recorded temperatures of just 23 to 26 °C - that is an astonishingly low rate in view of the usually passive cooling. The temperatures measured after our one-hour stress test were just as convincing: Only one measuring point above the key slightly surpassed 40 °C. The ultrabook did not even get lukewarm otherwise. The Core i7's sensor inside the casing recorded a maximum core temperature of 75 °C, which is far less than Intel specifies (100 °C). 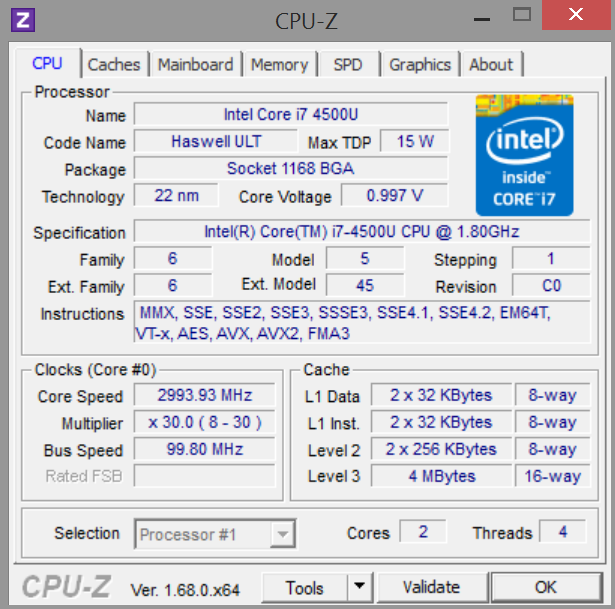 The reason that the CPU's clock rate nevertheless drops below the base speed of 1.8 GHz and settles to approximately 1.3 GHz is due to it reaching the TDP limit. 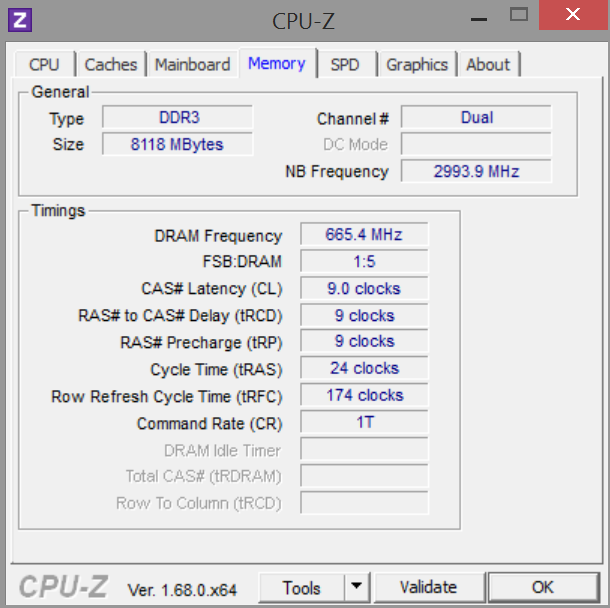 It is largely claimed from the GPU that is allowed to clock with a consistently high 900 MHz when Prime95 and Furmark are performed simultaneously. Toshiba touts its Kira-101 with a sound system from the HiFi manufacturer Harman/Kardon, which can only fulfill our high expectation to a degree. While the mids and trebles excel with a clear, rich, and balanced playback, the bass range is virtually just as underrepresented as in the contenders. Furthermore, we would want somewhat more volume reserves so that even larger rooms can be adequately filled with sound. 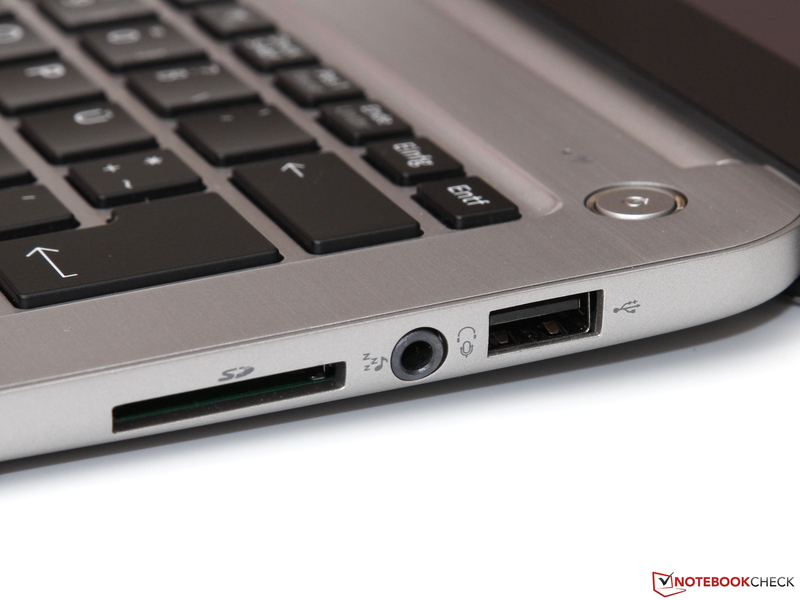 Thus, the user can only connect external speakers via HDMI or the jack in cases of doubt. 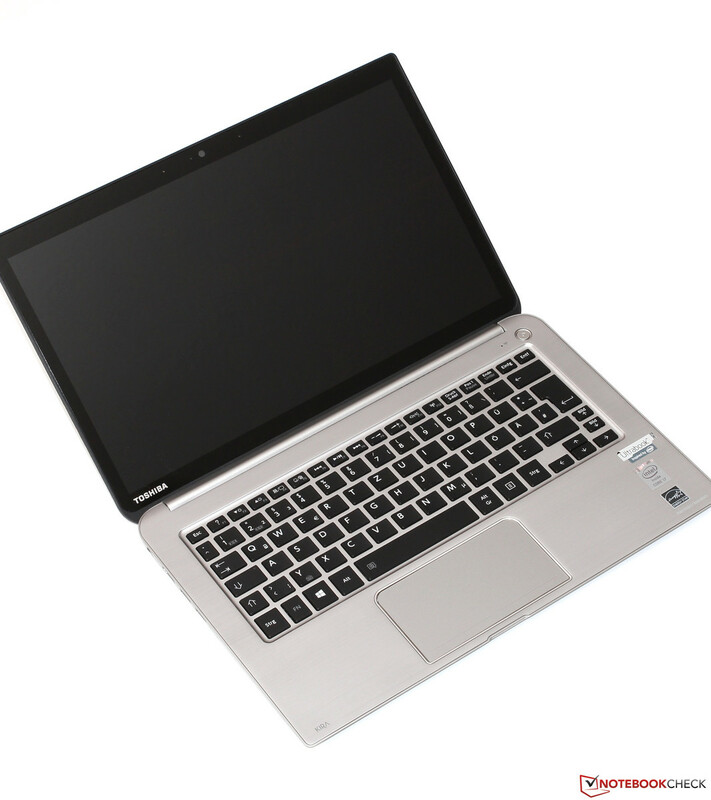 When the Windows desktop is idling, the Kira-101 is satisfied with as little as 3.3 to 7.6 watts, and thus it belongs to the most frugal ultrabooks of its category. 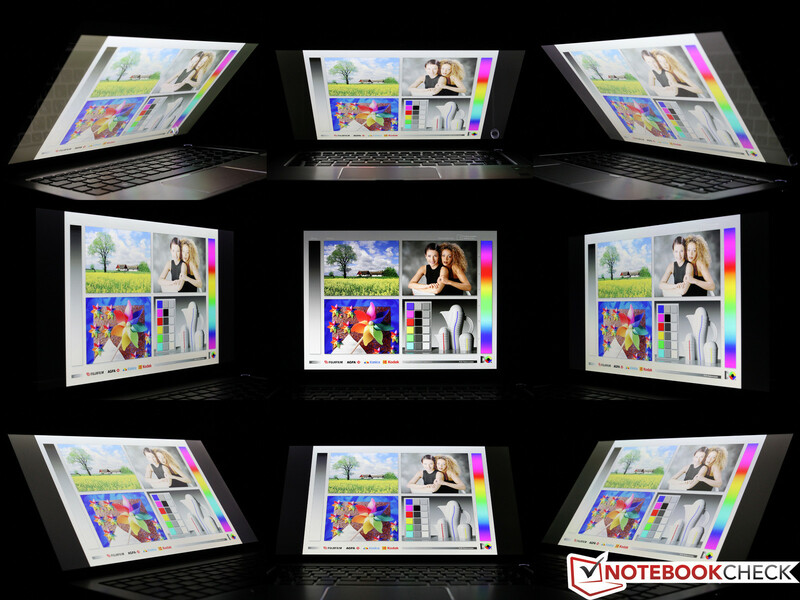 However, we want to keep in mind that this is not least due to the screen's considerably lower brightness than in the Zenbook UX301 or MacBook Pro Retina 13. Although the CPUs of the latter contenders only have a 13-watt higher TDP nominally, we measured consumption differences of up to 30 watts in full load. The Kirabook is satisfied with a maximum of 28.9 watts, while we ascertained rates of over 50 (Asus Zenbook) and 60 (Apple MacBook) in the competition. 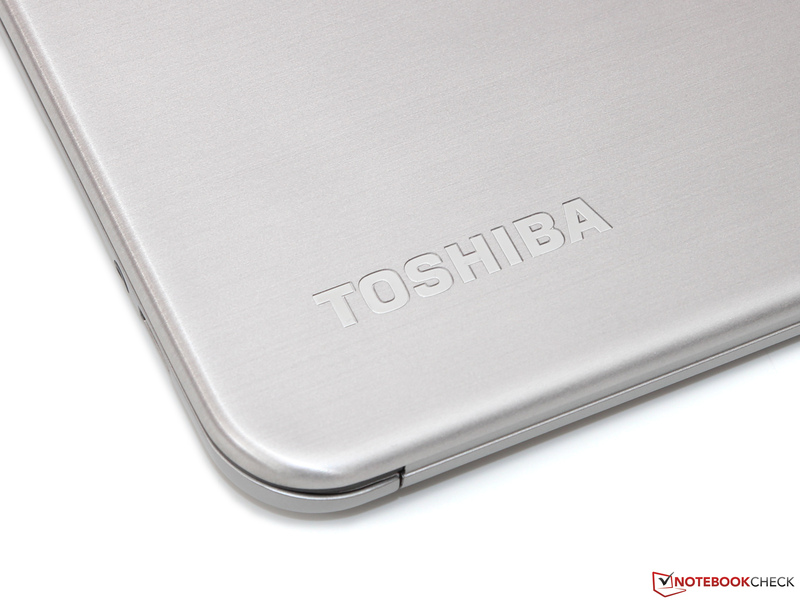 That is also an explanation for the significantly lower casing temperatures of Toshiba's ultrabook. In conjunction with the integrated 52-watt battery, the manufacturer promises a runtime of just over 9 hours. In no way does this statement seem overdrawn, seeing that we even almost achieved 14 hours in Battery Eater's Reader's test using energy-saving mode, minimum brightness, and Wi-Fi off. Naturally, these kinds of rates are hardly realistic. The user can count with approximately 6 to 7 hours for applications like browsing or video playback when the screen's brightness is adapted (approx. 150 cd/m²). The Zenbook UX301 (6.5 h) is roughly on par with that; both Dell's XPS 13 (7.5 - 8 h) and the MacBook Pro (8 - 9 h) last a bit longer. 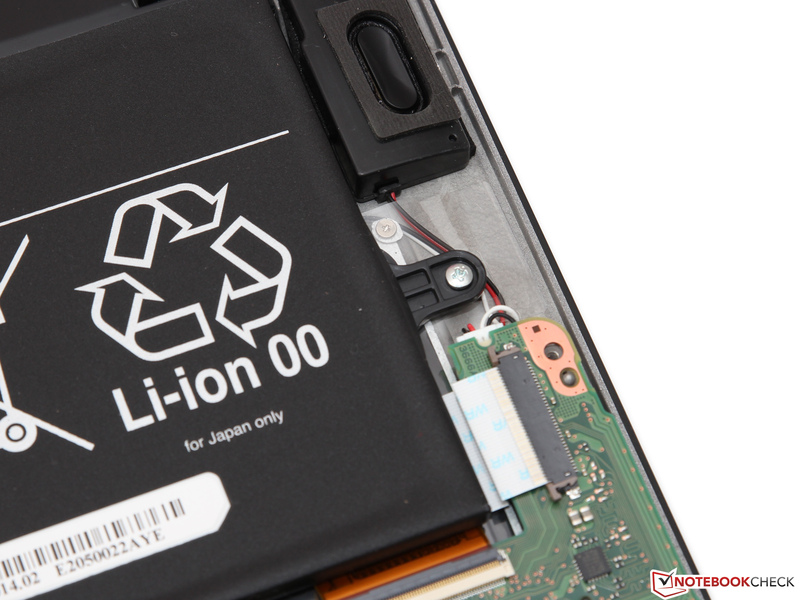 The battery can also be drained within just 2 hours when the user is determined to do so. Battery Eater's Classic test proved that using High Performance mode, maximum brightness, and Wi-Fi on. Recharging takes about 2.5 hours after that. 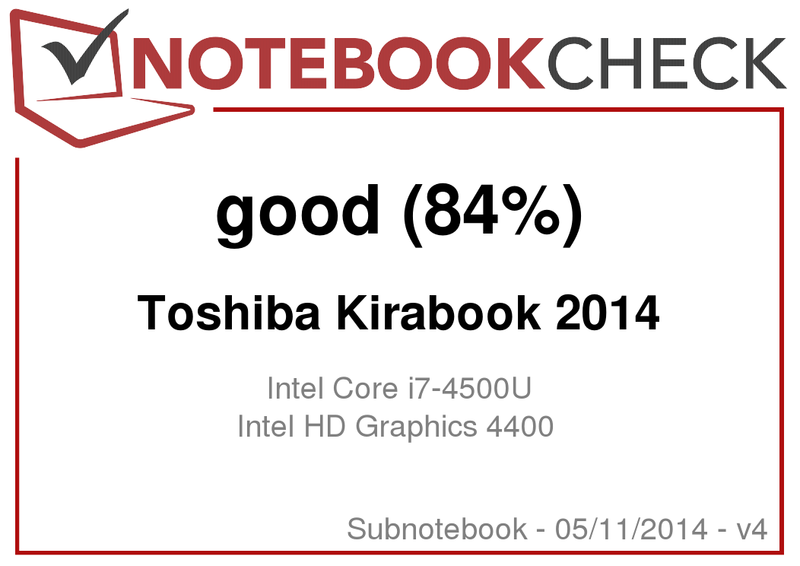 Good, but not good enough: Despite an overall convincing performance, Toshiba's Kira-101 does not reach a top spot in our ultrabook ranking list. The prospects are undeniably promising - as light as a MacBook Air, hardly slower than the MacBook Pro or Asus Zenbook UX301, topped with low emissions and impeccable input devices sound like a completed total package. Nevertheless, Toshiba will have a hard time in justifying the exorbitant purchase price of approximately 1500 Euros (~$2054). The aforementioned Apple contenders cost roughly 150 Euros (~$205) less with comparable equipment but feature a better build and offer a longer battery runtime at the same time. The Kirabook also has to compete with Dell's XPS 13 in the Windows camp. Its higher brightness more than just compensates for the lower screen resolution. 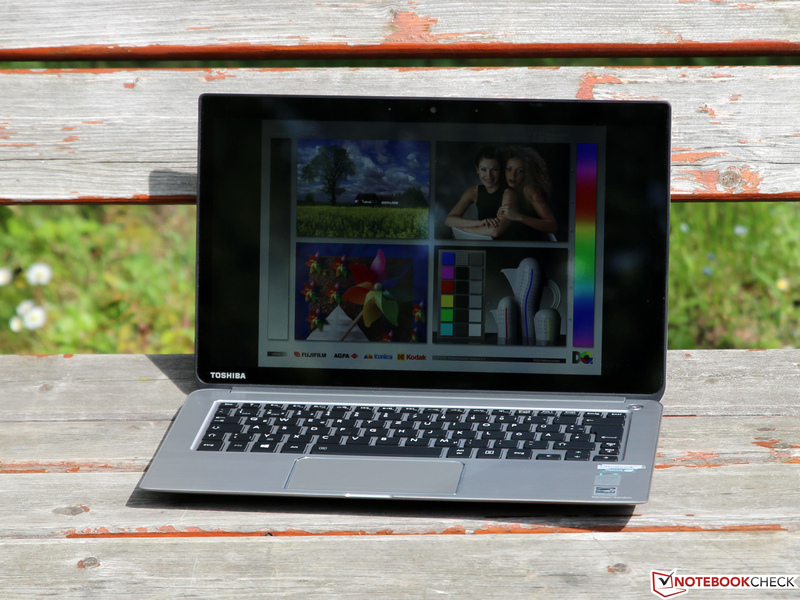 The brightness is probably our biggest point of criticism about the Kira-101 - an ultrabook that can only be used outdoors with restrictions barely does justice to its actual purpose. For this reason, we decided to deduct one percentage point from the final score. Notwithstanding this criticism, the Kirabook remains an outstanding ultrabook that certainly might earn a purchase recommendation in the course of future price cuts. ...is how the shiny silver magnesium chassis presents itself. ...made possible by an extremely narrow display bezel. ...we found a few minor flaws. For example, not all gaps are equally small. 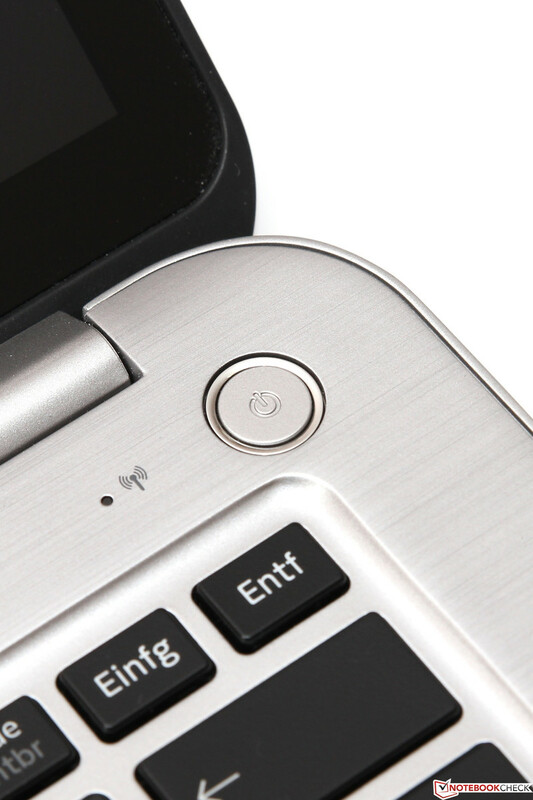 Stylish detail: The illuminated power button when in use. ...but provides HDMI and 3x USB 3.0. The input devices do not give reason for complaint. 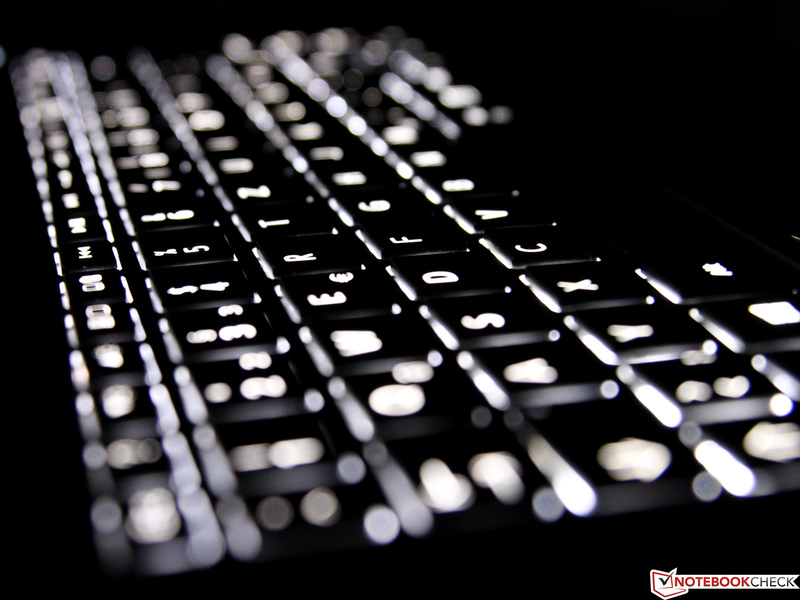 ...and the stylish LED backlight belong to the keyboard's biggest assets. 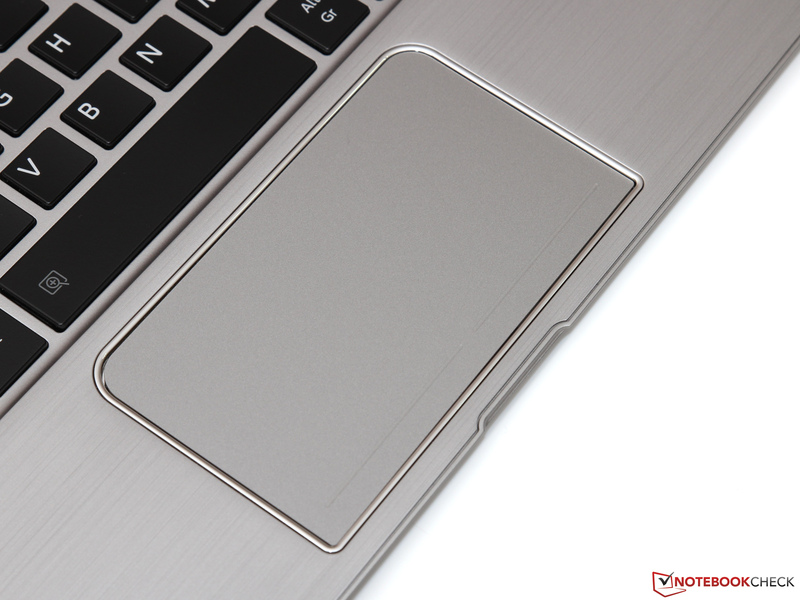 The ClickPad functions accurately and without delays. ...we discover the Kira-101's only fan. 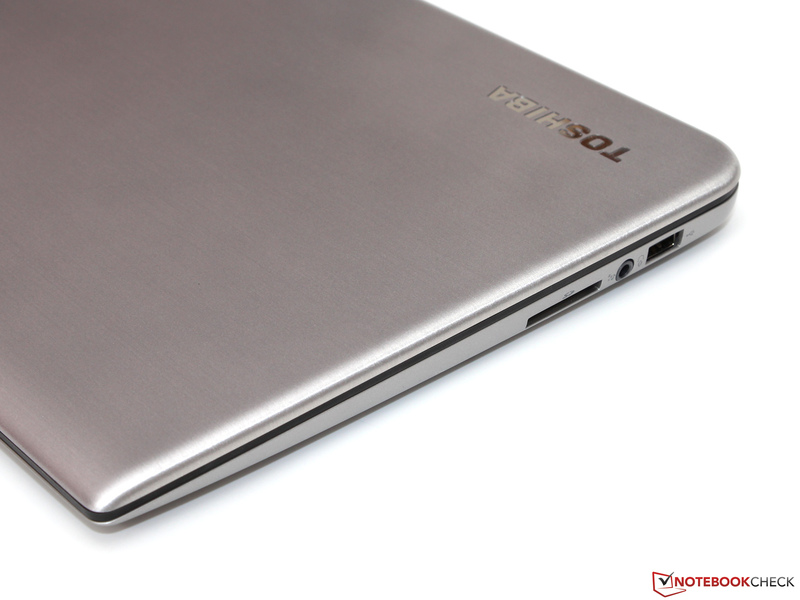 The frugal Core i7-4500U produces only little waste heat. ...but the memory is soldered. ...but also somewhat low bass sound. ...and allows for approx. 6 to 7 hours of practical use. Speedy hardware in an elegant packaging - not only Apple manages that. 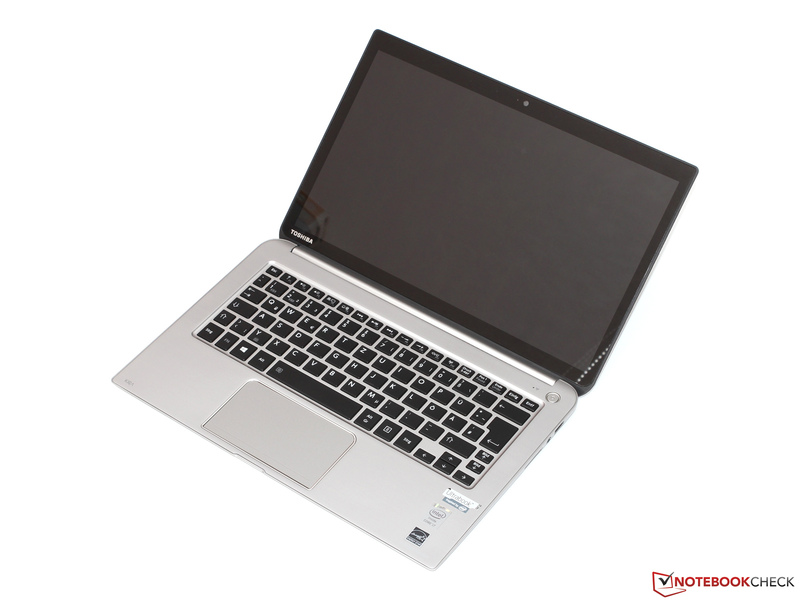 Toshiba comes amazingly close to the contender from Cupertino in terms of quality impression. 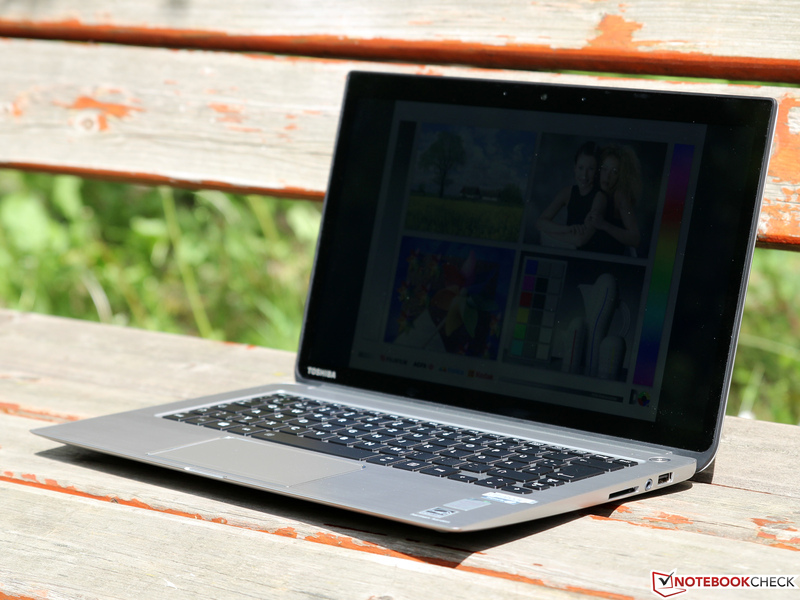 A bright screen should actually be standard equipment for every ultrabook. It's aggravating that the Kirabook messes up just with this crucial issue. The purchase price of approximately 1500 Euros (~$2054) is a very self-confident challenge to the contenders. We'll have to wait and see whether Toshiba can crack the market with it.